and in fetuses exposed in the womb during two distinct stages of development. " Pat Hunt, PhD, is a cellular and molecular biologist at Washington State University, where she heads a lab that studies the reproductive effects of environmental estrogens. Her lab is perhaps best known for its research on Bisphenol A, which impacts germ cell development and increases the rate of abnormal births. How did you get involved in the area of endocrine disruption on oocyte development? This is a famous story now. We started out doing non-related research. My primary focus was on the increased risk of a Down syndrome or chromosomally abnormal baby with age. We were conducting studies on chromosomal segregation and egg cell development. In the course of one study there was suddenly a huge shift in our control data, and months later we learned that our animals were being exposed to Bisphenol A (BPA) through their cages and water bottles. A temporary worker in the mouse room used a floor detergent in the cage washer, and the high pH of the detergent damaged the plastic water bottles and cages. They started to leach BPA immediately. It was pretty wild. We saw a night and day effect, and the next week all of our controls were crazy. It set our research back by more than a year. When we finally understood what was happening, we felt the effect was so extraordinary that we should continue along these lines and learn more about BPA. How did you identify BPA as the problem? It took a long time. There were no signs of damage on the cages or water bottles initially. We started looking for other problems--was there construction nearby and was something getting inadvertently sucked into the vivarium? Were pest contractors spraying a nasty pesticide around our animals? It wasn’t until the cages and water bottles started to show physical change that we put two and two together. Then we did a series of experiments to see if we could intentionally damage cages and water bottles to determine which was giving us the effect—it was both. We also analyzed water from the damaged bottles to determine how much BPA the animals were being exposed to. We sent water from the bottles off to collaborators for analysis, and they told us what levels were detected in our water samples. Our next series of experiments was eye opening. We fed a group of mice the amount of BPA that produced detectable effects, and we gave lower doses to several other groups of animals. We are geneticists, so we were interested in the lowest levels of the chemical that would affect cellular processes. Most toxicologists would have gone up—on the assumption that, if a little is bad, higher doses should be even worse. Of course this isn’t how hormones work. 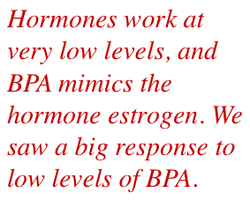 Hormones work at very low levels, and BPA mimics the hormone estrogen. We saw a big response to low levels of BPA. The original problem with the cages happened in 1998, but we didn’t publish until 2003 because we wanted to make sure we really knew what was happening. When we thought we had compelling experimental data, we submitted the paper and it made a big splash because the message was pretty sobering: this chemical we are all exposed to causes chromosome abnormalities in mice. If humans respond similarly, BPA exposure could cause an increase in miscarriages and birth defects. Your mice were originally exposed in 1998. Now that more than a decade of research has been conducted, how concerned are you about the impact of BPA on germ cell development? I think that more recent data from our lab and from others provides compelling evidence that BPA strongly impacts the ovary and that the effects are not limited to those we initially reported. We first saw increases in chromosomally abnormal eggs after adult females were exposed. 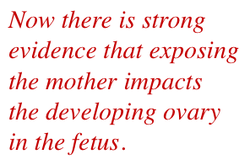 Now there is strong evidence that exposing the mother impacts the developing ovary in the fetus. In fact, two distinct aspects of egg development are impacted – the onset of oogenesis (egg development) and the packaging of the developing egg cells into follicles. In humans these occur during the 2nd and 3rd trimesters of pregnancy, respectively. In short, there are at least three distinct windows of egg development that appear vulnerable to the effects of BPA; we see effects in adult females exposed prior to ovulation and in fetuses exposed in the womb during two distinct stages of development. And now we are starting to see supporting data from human studies. The timing of events is different: Females start the process of making an egg during fetal development. Males don’t begin to make sperm until they reach sexual maturation. Nevertheless, the data suggest that BPA can impact the process of making gametes in both males and females. But, because of the differences in developmental time frame, the windows of vulnerability to exposure differ between males and females. A lot of published data suggest that exposure to BPA during testes development can induce changes in the adult such as a reduction in the weight of testes and a drop in sperm counts. But findings have been inconsistent. We are currently writing up a new study that we think sheds some light on the male effect. Our current studies suggest that BPA affects a process called recombination in males, and the outcome is completely different than in females. When cells divide to give rise to eggs and sperm during meiosis, the chromosome inherited from mom comes together with the one from dad to physically exchange genetic information. As a result, the single chromosome that you pass on to your offspring through the egg or the sperm is a mixture of the chromosomes you inherited from your parents. This complex process, called recombination, creates genetic diversity. We don’t all look alike because our genes are shuffled every generation. Importantly, these subtle changes during fetal development increase the likelihood that the mature female will ovulate eggs that are chromosomally abnormal. We published data a few years ago demonstrating that BPA exposure during fetal development disrupts the very important process of recombination in developing eggs. It now appears that a related yet different effect occurs in the male. When a male fetus is exposed to BPA in the womb during testis development, there is a permanent alteration of recombination levels in the adult. Levels of recombination drop below the rate of one exchange per chromosome pair in many cells, and these cells are killed. This finding provides one explanation for why BPA exposure reduces sperm count. It sets in motion a process that continues forward through the reproductive life of the male and acts to reduce the number of sperm produced. Our findings also explain some of the disparity in previous studies because we have found that not all inbred strains of mice are susceptible to this effect of BPA. Do you think environmental influences can damage oogenesis and ovary development in humans? Given the data from rodent studies, we were concerned about this, so we teamed up with Cathy VandeVoort at UC Davis to test the impact of BPA on the rhesus monkey ovary. The same effects on the developing ovary reported in rodent studies were evident in monkeys. This was also true in other tissues from monkeys examined by collaborators (breast, lung, heart, brain, and reproductive tract). In each study, however, some exposed animals showed greater effects than others, but the most affected individuals were not the same across studies. This is a really powerful set of data because it suggests that every monkey experienced significant effects, but not in all tissues. Because monkeys are a model that hits close to home, I think these studies raise very real concerns for humans.